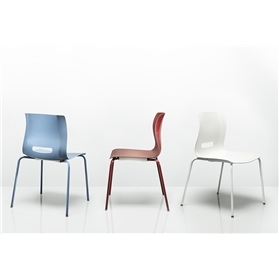 Casper is a stylish and contemporary café, dining plastic monoshell chair and stool design, for all manner of catering and hospitality environments in both the corporate and leisure markets, as well as being ideal for modern meeting applications. The distinctive angular faceted upper backrest blends down into the curvaceous seat in a unique way while the equally distinctive slot in the lower back, relieves the volume of the chair aesthetically. Casper provides a relaxing, supportive, comfortable sit with both flex and support in equal measure.